Do you have a business in La Fortuna. You can promote it FREE on this web site? See below for more details. Description: Vagabondo is a small hotel with 1O Italian style rooms, combinated with quality Mediterranean service and attention and great Italian food like real italian pizza. Vagabondo hotel is an excellent place to live a new experience in adventure, music and taste on your next vacation! 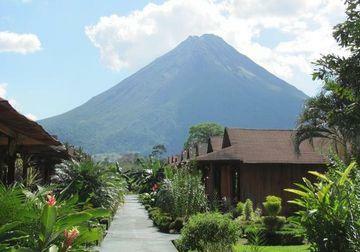 Description: Nestled in the heart of La Fortuna, and shadowed by the Arenal Volcano, located upstairs, next to the post office is La Forutna\\\'s only traditonal guesthouse, Pura Vida Guesthouse & Spa.